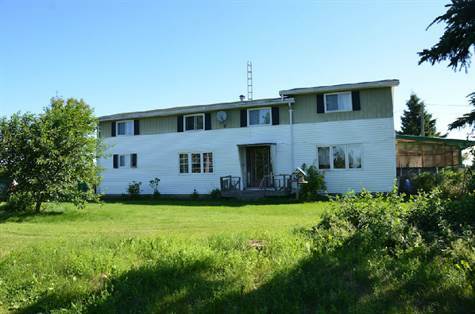 Baie Verte, NB - Hobby farm ready! 5 bedroom home with a large barn and one smaller bar (was used for chickens) and many fenced in areas on 3.55 acres. Large living room with new window and patio doors leading outside to fenced-in yard. Eat-in kitchen with fridge and stove included. Formal dining room with new window. 5 bedrooms upstairs. 2 full bathrooms. Updated electrical with new panel and rewired 13 years ago. New pump in well 2011, wood furnace only 10 years old. Items that are also included with home are: big screen TV 2011, washing machine, 2 freezers, 4 beds and all the furniture in the master bedroom, hutch in dining room. Great property for a home based business, organic hobby farm, dog kennel or horses. Just a short drive to town.